Our foals are solid built, beautiful Morgans. They are very athletic, with a classy style. Some are colored, some are gaited, and all are beautiful, passing on the original Morgan Horse virtues. Most of our foals will all mature over 15 Hands. Conformation and disposition is the focus of our breeding program. Our Morgans are what Morgans are suppose to be; beautiful, versatile, and dependable. We imprint our foals from birth. Within their first 4 months of life, we are able to safely trim hooves, use electric clippers on bridle paths, worm, lead, tie, and load in the trailer. 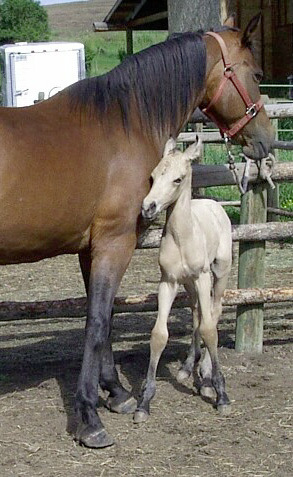 Foals are weaned at 4 months. We strive for gentleness and trust in the horse, practicing the Natural Horsemanship Technique. Our broodmare band has grown through use and evaluation over these last 20 years. Our bloodlines are strong in Sellman, Brown, Hill, Brunk and Old Government. We breed to preserve Morgan type and personality, correct conformation maintaining the original western athletic horse, breeding that was the true Verstile Horse.